Upon arriving home from work the other day I pulled up in front of my mail box to retrieve my, well uh, mail. I expected at least a bill or three, perhaps a Value-Pack envelope filled with coupons of which I might save a few and never redeem, and the new catalog from the local park district outlining the classes I will be too lazy to sign up for. What the (insert explicative here)? I have, in the past, actually complied with some of these letters. The past being like…an ice age ago. Now, no one responds to this crap, including me, so why would I participate? 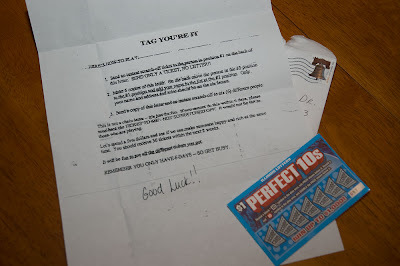 I could scratch off this lottery ticket, not win, and send ‘copies’ of said letter (Note picture above; it’s been copied to the point of gibberish) to whatever unsuspecting fools I came up with from my Rolodex. I would then have to spend ‘my’ money on scratch offs to send to others that won’t participate. My recipients would either call me thanking me for the windfall from said ticket or to tell me I am now officially off their Christmas card list (hey, it might be worth it for that). Though these damn ‘chain gangs’ aren’t infringing on the Pony Express as much as they used to; they have wreaked havoc on the internet. I can’t tell you how many emails I get with wording like, ‘Pass this on to five friends and see what happens!’ Yeah, uh, nothing happens…other than you’ve pissed five people off. Now I have the option of sending the scratch off ticket I received back to the person that sent it to me within six days (which in real time equates to two months) so she could send it to someone else. I also have the option of scratching said ticket. I could then purchase just one ticket and send it to the person that sent this to me and she would be none the wiser if I didn’t send it out to anyone else. 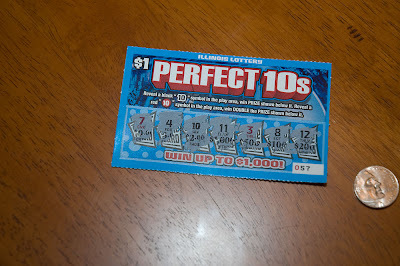 Of course if I scratched it and won $1,000.00 I might feel obliged to dole out another six bucks. Hmm, what to do. Bet you’re all wondering what I did end up doing. Yeah, nothin’. I guess I should probably spend a buck on a ticket, swipe an envelope from work and run it through the postage machine and be done with it…or plead the fifth if confronted by said chain gang. I loved your chain gang ending..still rolling. The video was so awesome. Man that made my day. I think you should find a picture of a piece of chain, print it up, and then mail it out to the next couple of people on the list. You know. A real chain letter. I'd toss it in the trash. Loved the video! I'd do exactly what you've done. Scratch the ticket and then forget it. Besides everything else, chain letters are illegal. Or send her the scratched off ticket back. Not imaginative but stops the chain. I got one last week from a girl at work that involves mailing used books to 6 people or something like that. The letter is still sitting in my desk. I never get these - but I woulda done the same exact thing! OMG...people still do that?? I'd trash it as well. I'm evil. I'd send that card, scratched off, back to her. Send it back. Send it back!!! OH my god, really. Chain mail still exists. I can easily blame any life problems I might have on all the chain e-mails I've ignored. Send me a message with nice thoughts, great. Send me one trying to guilt me into sending it on? Ugh. I think that damn letter should stop with you. It's GOT to stop somewhere. scratch and toss. I can't stand those things. I always want to send it back to my friend and ask them, 'Do you hate me or what?" I'd toss it in the trash. But, I sure loved the video! Hi, I got one of those chain letters today. I have decided to wait a couple of days and send it back to the "friend" who sent it to me. I hate chain letters and besides it's illegal to boot. That said, thanks for that video. It made me laugh my *** off, and sure relieved the tension the letter gave me.